Swisher Sweets is one of the largest machine-made cigar manufacturers in the world. Located in the United States, these cigars combine the finest tobaccos sourced from both inside and outside our borders. Famous for their smooth and consistent burn, these high quality cigars and cigarillos come in a huge variety of flavors. 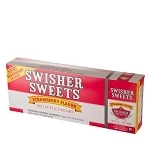 Tobacco General offers a larger list of Swisher Sweets flavored cigars in flavors such as menthol little cigars, peach little cigars and grape little cigars. Tobacco General also offers blunts, cigars and cigarillos. The Swisher Sweets machine rolled cigars come in flavors such as Kings, Perfecto, Slims and Wood Tips. The Swisher Sweets blunts come in only one flavor; regular. Swisher Sweets cigarillos come in flavors such as Cherry Tip, Coronella, Grape, Grape Mini, Peach, Sweets, Strawberry, Tequila, White Grape, Wine and many more. Almost every flavor and packaging of Swisher Sweet cigarillos come in more affordable Pre-Priced options. These packs have the exact same cigars and cigarillos, but are manufactured specifically for retail and convenient stores. The catch, you have to deal with a sticker on the outside wrapper.